Figure 11.2. 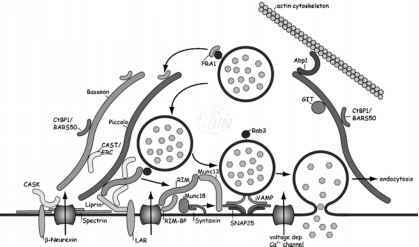 TSP is Necessary and Sufficient for Synapse Formation. (A) Purified CNS neurons do not form synapses under control condition (Control) as seen by the absence of synaptic puncta after staining for presynaptic synaptotagmin and postsynaptic PSD-95. Addition of recombinant TSP2 (rTSP2) induces a dramatic increase in the number of colocalized presynaptic puncta and postsynaptic puncta (yellow puncta in Colorplate 8). Graph shows a nearly 4-fold increase in synapse number after addition of rTSP2 that is comparable to the increase elicited by the astrocyte-conditioned medium (ACM). (B) Postnatal day 21 wild-type (WT) and TSP1/2 double knockout (KO) mice brains were sectioned and stained for presynaptic marker Bassoon and postsynaptic marker SAP102. KO animals show a reduction in the number of colocalized synaptic puncta (arrows). Reprinted from ref. 30, Copyright (2005) with permission of Elsevier. The pentraxin family is a large family of proteins defined by a conserved motif, the pentraxin domain. Some pentraxins are structurally characterized by the arrangement of subunits in a pentamer. The pentraxin family is further broken up into two main types of pentraxins, the short pentraxins and the long pentraxins. The short pentraxins consist of C-reactive protein (CRP) and serum amyloid P. The long pentraxins consist of pentraxin 3 and 4 (PTX3 and PTX4), neuronal pentraxin 1 and 2 (NP1 and NP2, also known as Narp), and neuronal pentraxin receptor (NPR)31. The first identified role for pentraxins was a role in innate immunity. Innate immunity is characterized by the recognition of pathogens and damaged tissue by pattern recognition receptors. The first pentraxin to be identified, CRP, is an example of such a receptor. This pentraxin binds to the C-polysaccharide of Streptococcus pneumoniae and mediates the immune attack and kills sequence for complement-mediated lysis of these pathogenic bacteria. Similarly, serum amyloid protein also binds a variety of pathogens and mediates the innate immune response to pathogens. In addition, pentraxins appear to play an important role in tissue remodeling associated with fertility and inflammation32-34. The neuronal pentraxins, NP135, NP236-39, and NPR40, were identified as proteins that bind to affinity columns of the presynaptic snake venom toxin, taipoxin, and/or the lumenal calcium-binding protein TCBP4941. NP1, NP2, and NPR protein sequences are 50% identical to each other and their carboxy terminal half is 20-30% identical to classical pentraxins such as the acute phase proteins, CRP42, serum amyloid P protein43, and the long pentraxin, PTX344. Neuronal pentraxins form heteromultimers45. While NP1 and NP2 are secreted when expressed alone, they can also be tethered to the cell membrane when expressed as heteromultimers with NPR. NP2 has also been identified as a synaptic protein that is rapidly and dramatically upregulated by neuronal activity39. This places NP2 in the family of immediate early genes. The function of NP1 and NP2 in vivo is unknown, although both NPs have been implicated in regulating glutamate receptor clustering in vitro. One of the best studied functions of NPs is the clustering of AMPA receptors (AMPARs). Both NP1 and NP2 are capable of clustering AMPARs in vitro. Initially, NP2 was found to cluster AMPARs in culture46. This study reported that NP2 was enriched at excitatory synapses both on hippocampal and spinal neuron cultures, and the expressed Myc-tagged NP2 was delivered to synapses. Strikingly, NP2 molecules co-clustered and co-immunoprecipitated with AMPA receptor subunits GluR1-3, but not with the AMPA receptor subunit GluR4, NMDA receptor subunits NR1 and NR1/2A, or kainate receptor subunit GluR6. Expression of a dominant-negative NP2 mutant protein, which prevented secretion of endogenous NP2, inhibited NP2 accumulation at synapses and affected clustering of AMPARs. Because it is not entirely clear that the dominant-negative NP2 exerts its effects only through NP2 secretion, these results must be interpreted somewhat cautiously. It is possible that endogenous levels of NP2 are not directly involved in AMPAR clustering, but this work certainly implies that NP2 plays some role in this process. Recent work has suggested that NP2 may also indirectly cluster NMDA-type receptors in spinal neurons. Mi and co-workers47 found that NP2 may act through the AMPAR subunit GluR2 to cluster NMDARs containing the NR2A or NR2B subunits. This clustering depended both on the GluR2 C-terminal tail and on the C-terminal tail of stargazin, a protein found to cluster AMPARs at synapses48. NP2 does not directly bind to either NMDARs or stargazin, implying that there may be an interaction between clustered AMPARs and NMDARs through stargazin in nonspiny neurons. Interestingly, these authors also found that stargazin DC (Stargazin without the C-terminal domain) does not affect surface GluR1 clusters in transfected nonspiny motor neurons and hippocampal interneurons, despite having a potent effect on reducing GluR1 clusters in spiny hippocampal pyramidal neurons48. Because NP2 can cluster AMPARs on these types of neurons, one interpretation of this result is that NP2 takes the place of stargazin for AMPAR clustering. However, stargazin is one member of a family of proteins termed Transmembrane AMPA Receptor Proteins (TARPs) with AMPAR binding and surface expression and synaptic targeting functions49. Thus, it is quite possible that different members of the TARP family are required for AMPAR clustering in different types of synaptic connections. Nevertheless, based on the previous work, it appears that NPs play a role in the clustering and synaptic distribution of AMPARs, especially at nonspiny synapses. Because NP1 shares about 50% sequence identity with NP2 and has also been shown to cluster AMPARs, it is thought that these two proteins may function in concert to cluster AMAPRs at nonspiny synapses50-52. Overexpression of NP2 not only induced clustering of AMPARs but also increased the number of excitatory synapses in hippocampal cultures46. Furthermore, NP2 expression in transfected HEK293 cells was sufficient to induce AMPAR clustering on neuronal dendrites that contacted the transfected cells. Interestingly, these overexpression studies revealed that NP2 can be secreted to synapses both from the presynaptic terminal as well as from the postsynaptic dendrite, although it is not clear whether under normal conditions there is significant dendritic expression of NP2. In subsequent studies it was found that dominant-negative NP2 not only reduced the number of GluR1 subunit AMPAR clusters at contact sites between a dominant-negative NP2 expressing neuron and a postsynaptic neuron, but also induced a slight, although significant, decrease in the number of excitatory synaptic contacts in this connection50. No effect was found on the number of inhibitory synapses as assessed by gephyrin or GAD clusters. These studies led to a hypothesis that NP2 in the CNS may act analogously to agrin clustering of nicotinic acetylcholine receptor clustering in the PNS (see Chapter 1), being necessary and sufficient to cluster AMPARs at excitatory synapses and thereby leading to increases in the number of synapses found in culture. Both NP1 and NP2 are able to cluster AMPARs, but pentamers comprising both NP1 and NP2 have greater clustering activity than pentamers of either alone52. Interestingly, while secretion of NP2 is activity dependent, secretion of NP1 is not39,52. This finding leads to a model in which neurons have a low level of receptor clustering activity through NP1 that is dramatically upregulated by activity and subsequent release of NP2. Thus, this mechanism appears to contribute to both activity-independent and activity-dependent excitatory synaptogenesis52. What roles NP1 and NP2 play in vivo are completely unknown. NP1, NP2, and NP1/2 double KO mice must be carefully analyzed to understand the role of this neuronal ECM protein in synapse formation and function.